Writer, author of the novel Jetlag. Publicist, former editor-in-chief of magazines Kawaii and Anime+, popularizer of Japanese pop culture and fantasy in Poland. 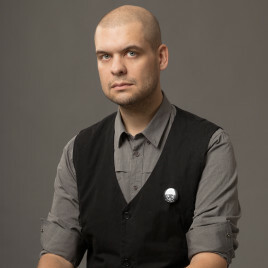 He has been published in Gazeta Wyborcza, as well as magazines Pulp, Nowa Fantastyka, Kmag, Arigato, the portal next.gazeta.pl, as well as the books Bond. Leksykon, Seriale. Przewodnik Krytyki Politycznej and Berlin – Pascal Lajt. He runs the blog Pattern Recognition (mrw.blox.pl) and jetlag.com.pl.